The St. John Fisher College men’s and women’s basketball teams will be participating in the Mark’s Pizza Crosstown Shootout on Thursday, Dec. 6 and Saturday, Dec. 8. Rochester Institute of Technology, University of Rochester and Nazareth College are the other teams that will be competing. 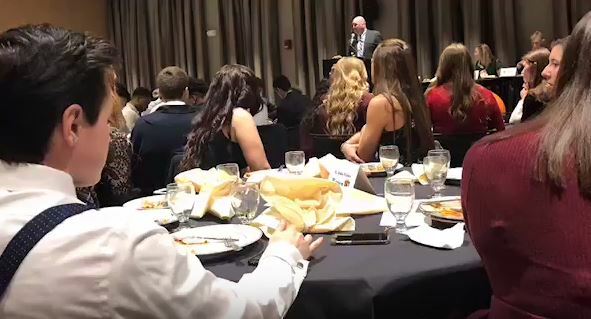 Tournament week started with the Mark’s Pizza Crosstown Shootout team banquet at the University of Rochester on Sunday, Dec. 2, featuring all of the participating programs. All money raised for this tournament such as concessions, admissions and donations will be going to the American Cancer Society for research. The banquet started with an introduction from tournament director John Serafine. He discussed his excitement about the third annual crosstown rivalry games along with his preparation to make this tournament possible. Following Cimiluca, a representative from each school went up on stage to discuss the reasons for participating in the tournament and supporting the American Cancer Society. The four students that spoke on behalf of their teams were Jaymee Rosser of RIT, Jacob Wittig of U of R, Demetria Woodard of Nazareth College and Erin Hulbert of St. John Fisher College. Hulbert spoke about how everybody in the room is affected by cancer in some way. “Basketball aside, we are able to play for something much more than bragging rights or the fun of the game,” she said. Hulbert then went on to thank Mark Crane, owner and founder of Mark’s Pizza, for donating money to make this event possible. Then the other three students spoke along the lines of how cancer has affected them in some way and why this event is important to them. The next and final speaker of the night was Mike Neer. Neer, former head coach of the University of Rochester men’s basketball team for 34 years and Division III National Coach of the Year in 1990, discussed how the tournament isn’t only rivalry games, but how it raises awareness for a great cause. “Never take moments like these for granted when playing the game you love because one day you may wake up and your life can change in a blink of an eye,” stated Neer, with a reference to how cancer can change anyone’s life. He concluded his speech with wishing all the teams the best of luck this weekend and telling them to have a good time. The men’s teams from the four schools will play at Fisher’s Manning and Napier Varsity Gymnasium on Thursday, Dec. 6 and Saturday, Dec. 8. Nazareth will take on RIT at 6 p.m. Thursday, followed by Fisher hosting U of R at 8 p.m. The women’s matchups will take place at Nazareth, with Fisher playing U of R Thursday at 6 p.m. and followed by the host Golden Flyers against RIT.